Traditionally, fluorescent lamps have been operated at the same 50Hz or 60Hz frequency as the periodicity of the mains electricity supply. However when the world's first installation of fluorescent lamps operating at high frequency was introduced, it was observed that lamp efficacy increased dramatically. Figure F17 reveals that it is possible to increase luminous efficacy by almost 10% when driving the lamp at frequencies in excess of 2000 Hz. This feature is capitalised on by the modern electronic ballast to achieve peak system efficacy from the lamp-ballast combination. The reason for this effect is relatively simple to understand. In the case of an ordinary incandescent lamp operating on a 50-60Hz AC supply, the lamp delivers light during the entire period of the waveform. At the instants when the voltage is lower than the peak value, the lamp still delivers light but a slightly lesser quantity. Furthermore the thermal mass of the incandescent filament is such that it cannot heat up and cool down at the same rate as the current supply (except in case of extremely small lamps). Thus despite the AC power source, the lamp delivers a continuous light output. Fluorescent lamps are different in that below a certain threshold voltage, the discharge is extinguished and the lamp emits no light. By increasing the supply frequency, the duration of the 'off' periods is proportionally reduced. 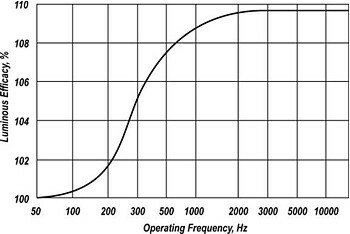 Increasing frequencies begin to approximate the situation of a constant current DC source, in which the discharge emits light continuously. Owing to this phenomenon, the lamp emits more light. Incidentally, the first high frequency installation of fluorescent lamps was on the train carraiges of the London Undeground. Formerly that company operated its own independent power station which generated a 400Hz mains frequency. Owing to the fact that the inductance of a ballast varies as a function of its operating frequency, special units had to be engineered for this installation. It was noted that their dimensions and mass were considerably less than for conventional 50-60Hz ballasts.